If you’re thinking about the horse-for-the-course angle in the Kentucky Derby, better have something more in your handicapping toolbox. 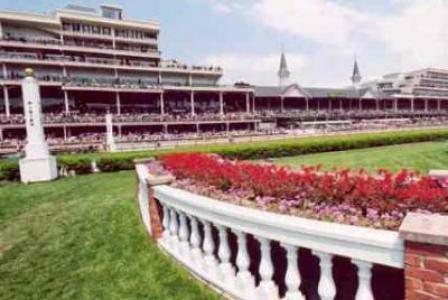 More than two dozen horses that previously won as a 2-year-old at Churchill Downs failed in the Derby. The average finish of about 50 runners with at least one race on the main track was off the board. However, two colts during the past four years repeated their victories in sophomore stakes at Churchill Downs in the Derby: Street Sense in ’07, who captured the ’06 Breeders’ Cup Juvenile, and Super Saver in ’10, who won the ’09 Kentucky Jockey Club. More important over the long haul is how horses handle the main track working toward the big dance as most winners during the past decade posted bullet workouts. Two horses that probably will be longshots have really taken to Churchill Downs. Santa Anita Derby winner Midnight Interlude, who has only raced at the California track, has posted two bullets on less than fast surfaces. The son of War Chant on Monday breezed five furlongs in 1:00 4/5 in the slop. On April 27, he breezed six furlongs on a good surface in 1:13 3/5. Shackelford, runner-up in the Florida Derby, has recorded two bullet works: 58 4/5 breezing for five furlongs on the fast main track last Saturday and 1:00 1/5 breezing for five furlongs in the slop on April 23. In addition, the son of Forestry did break his maiden at Churchill Downs, capturing a seven-furlong race. However, his running style isn’t exactly the way to win the Derby. During the previous 136th renewals only 22 horses went wire to wire. The last time was in ’02 when War Emblem triumphed by four lengths. Spend a Buck led at every call in ’85 winning by 5 ¼ lengths recording the fourth fastest time for the 1 ¼-contest: 2:00 1/5. Since ’87, seven horses that had the lead at the eighth pole weren’t the first to hit the wire. However, only Sea Cadet in ’91 failed to hit the board, finishing eighth. Four managed to run second: Closing Argument, ’05; Cavonnier, ’96; Casual Lies, ’92; and Bet Twice, ’87. Two horses in Saturday’s Derby that like to come off the pace posted bullets for works last month. Gotham winner Stay Thirsty breezed five furlongs in the slop in a minute on April 24, the quickest of 19 works. On Sunday, he went five furlongs in the slop in 1:01 4/5, two two-fifths slower than stablemate Uncle Mo, who won the BC Juvenile last year at Churchill Downs. Arkansas Derby winner Archarcharch caught a fast track on April 29 and breezed five furlongs in 59 2/5, sharing the quickest time of 59 runners. The son of Arch ran once at Churchill Downs back in November, finishing second in his career debut in a seven-furlong maiden special weight contest. Surprisingly, Florida Derby winner Dialed In, the likely lukewarm Derby favorite has confined his workouts to the Palm Meadows training facility in South Florida. The son of Mineshaft on April 28 cruised five furlongs in 48 2/5, third fastest of six runners. Dialed In broke his maiden right off the bat in November at Churchill Downs, taking a sprint. Arch+3 got the #1 hole. What is he going to do? Brillant Speed #2 falls back n does Arch. There is always a crowd to make the curve at the begining. Hate the number of horse on KD day. Way to many. We saw CD and it is narrow track compared to Arlington. Hi, I was reading some of your articles and I was interested in some kind of horse racing advertising for a client in your articles. Is this something that might interest you?